Following the success of his New York Times bestseller, Until Tuesday, Iraq War veteran Luis Carlos Montalván advocated for America's wounded warriors and the healing powers of service dogs. In this spectacular new memoir, Luis and Tuesday brought their healing mission to the next level, showing how these beautifully trained animals could assist soldiers, veterans, and many others with mental and physical disabilities. They rescued a forgotten Tuskegee airman, battled obstinate VA bureaucrats, and provided solace to war heroes coast-to-coast. Luis' death in December 2016 was another terrible tragedy of the invisible wounds of war. This book was his last letter of love to his best friend, Tuesday, and to veterans, readers, friends, and fellow dog lovers everywhere. 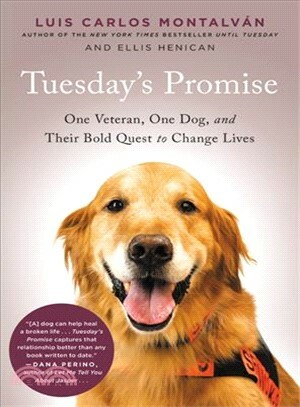 Never more timely than now, Tuesday's Promise is an inspiring story of love, service, teamwork, and the remarkable bond between humans and canines. Luis Carlos Montalvan was a captain in the U.S. Army who served two combat tours in Iraq, where he earned the Combat Action Badge, two Bronze Stars, and the Purple Heart. He was the bestselling author of Until Tuesday: A Wounded Warrior and the Golden Retriever Who Saved Him and two children's books, Tuesday Tucks Me In and Tuesday Takes Me There. He and Tuesday advocated for veterans and others with disabilities, tirelessly promoting the virtues of service dogs. He is buried at Arlington National Cemetery.